Shadows on the Trail Quadrilogy - Let the Adventure Begin! 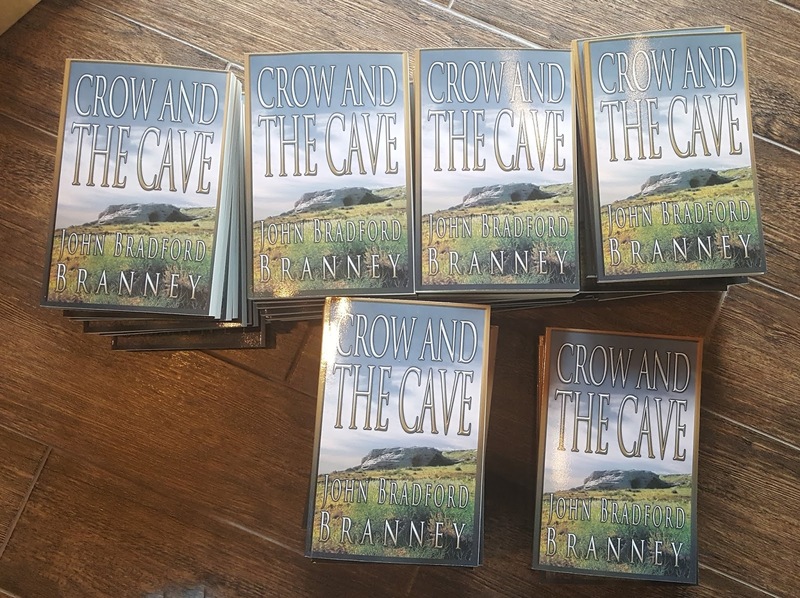 The prehistoric adventure book series that captures real life on the high plains of Texas and Colorado around 10,700 years ago. See if YOU have what it takes to survive with the Folsom People! Figure One - Three inch long Montana Clovis point made from a multi-colored jasper. How do we know who old Clovis points are? John Bradford Branney Collection. In Part One of my series on radiocarbon dating, I present the overall radiocarbon dating process and some of its pitfalls. In Part Two of my series, I will present how these radiocarbon dates are reported in archaeological site reports. My intent is to share the information that I learned during researching the topic. It is not my intention to cover all the nitty gritty little details of the radiocarbon dating process, but to give my readers enough information for a basic understanding and appreciation of the process. I have found that the radiocarbon dating process is a lot like sausage making; you can generally understand how sausage is made, but the less information you have about the ingredients, the better. I have read a ton of books and reports on archaeological sites, especially about the Rocky Mountain region. I read these books and reports because I am interested in archaeology and I want to know more about my own prehistoric artifact collection. I also do research for the books I write, such as my prehistoric adventure book series entitled the SHADOWS on the TRAIL QUADRILOGY (figure two). It has always baffled me how archaeological books report the radiocarbon dates for sites. It seems that every author uses different phrases and nomenclature when reporting a site's radiocarbon date. For example, these are two reported dates; 10,000 RCYBP and 10,000 years BP. Do they mean the same thing? Are these sites 10,000 years old? The answer is no. The first date is an uncalibrated radiocarbon date and the second date is a calibrated radiocarbon date (don't worry, I will discuss this later). I seldom see an author report the age of an archaeological site in simple terms that everyone can understand, such as "this site is 10,000 years old". What do you know about the radiocarbon dating process? Radiocarbon dating has become indispensable in archaeology. Almost every archaeologist uses radiocarbon dating in one way or another. If we understand the basics of the radiocarbon dating process, it helps us to understand the dating methodology in archaeological books and reports. As consumers of these reports, we need a general understanding of the process and its strengths and weaknesses. Figure Three - How the radiocarbon dating process works. Radiocarbon dating is one of the most widely used methods for scientists to determine the relative ages for biological specimens, such as wooden artifacts or bone. The process uses a natural phenomena occurring in the Earth’s atmosphere (figure three). When cosmic rays from the sun bombard nitrogen atoms in our upper atmosphere, an unstable, radioactive carbon isotope called carbon-14 is created in the upper atmosphere. This carbon-14 isotope oxidizes into a carbon-14 dioxide isotope which settles in the lower atmosphere. Plants and algae take in this carbon-14 dioxide isotope at the same ratio that it exists in the atmosphere. Other living organisms within the food chain also exchange carbon with the atmosphere through respiration and by eating other organisms. These organisms incorporate the carbon-14 isotope into their tissue at the same ratio as the atmosphere. When an organism dies, its carbon intake stops and the radioactive carbon-14 isotope in its tissue starts to decay into stable carbon-12 isotope. Radioactive decay is the process by which an unstable atomic nucleus loses energy (in terms of mass) by emitting radiation. 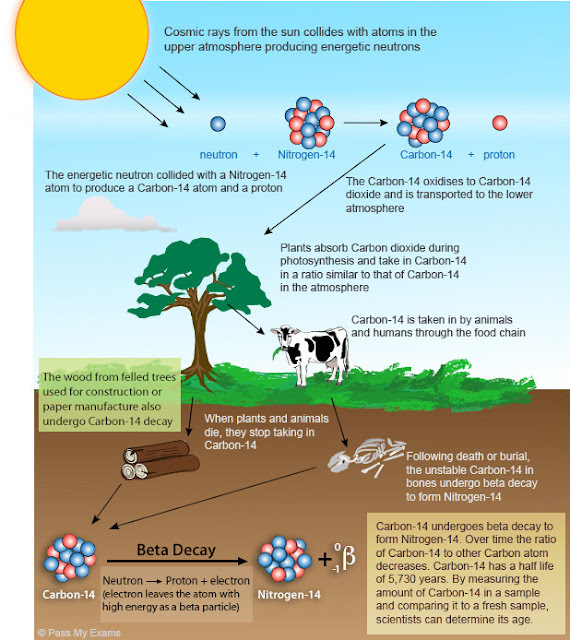 The carbon-14 isotope has a radioactive half life of approximately 5,730 years, which means in 5,730 years half of the carbon-14 isotope in the dead organism has decayed to a stable carbon-12 isotope. To come up with an age for the dead organism, archaeologists and scientists test its remains for the presence of the unstable carbon-14 isotope and its ratio to the stable carbon-12 isotope. Wood and charcoal are the best materials to use for the process, but other once-living materials will work, as well. Radiocarbon dating is probably the most reliable tool in the tool box for dating archaeological sites, but the process has a few challenges we should be aware of. The first challenge for the archaeologist is to find a reliable and uncontaminated sample within the cultural material that is of interest. The archaeologist must ensure that the sample tested is associated with the cultural material in question, and that the sample is not contaminated with unrelated organic deposits. For example, testing a piece of charcoal from a prehistoric fire hearth in a geologic horizon where there is clinker coal deposits from an earlier geological episode. The second challenge is that the site must be less than 50,000 to 60,000 years old. As previously mentioned, the half life of the carbon-14 isotope is 5730 years. If you cut the amount of carbon-14 in half a few times through decay, statistically there is very little carbon-14 left to measure. The line in the sand for an accurate measurement ends at 50,000 to 60,000 years old. The third challenge is the biggest hurdle to overcome. In my third paragraph, I explained how cosmic rays from the sun bombard nitrogen atoms in our upper atmosphere, creating the radioactive carbon-14 isotope which is the key ingredient needed for radiocarbon dating. So far, everything is hunky dory; we know the half life of carbon-14 and the amount of carbon-14 produced in the atmosphere. Therefore, we should be able to determine the remaining amount of carbon-14 isotope in our sample and thus its age. Unfortunately, it isn't that easy. The big kicker is that the bombardment of cosmic rays from the sun has not been consistent through time, therefore, the production of carbon-14 isotope has not been uniform through time. Throughout geologic time, there were peaks and valleys in the production of the carbon-14 isotope in the atmosphere. As an example, archaeologists believe that between 11,300 to 11,600 years ago, less carbon-14 isotope was produced in the atmosphere than today. This throws everything out of whack. 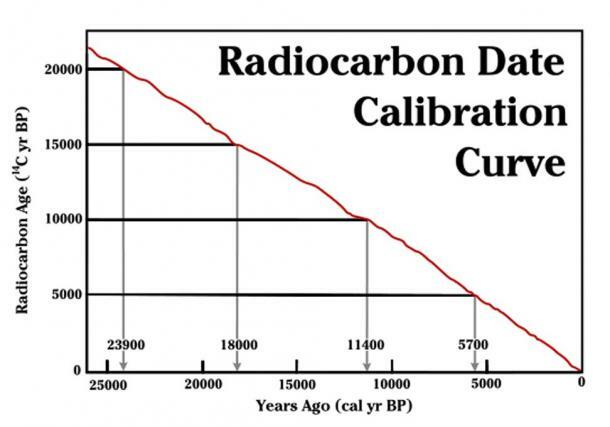 A reduction in the production of carbon-14 isotope results in a flat plateau along the radiocarbon dating calibration curve which results in a difference between a measured radiocarbon years and actual calendar years. Radiocarbon years must be calibrated to calendar years using dendrochronology, and estimates of peaks and valleys in the production of carbon-14 isotope in the atmosphere. Messy is the best word to describe it. This is one of the main reasons some archaeologists report ages in uncalibrated radiocarbon years - it is cleaner to report it that way. Confused yet? Don't feel like the Lone Ranger! and calibrated radiocarbon dates (bottom axis). The graphic in figure five illustrates my above point. The vertical axis (left-hand) shows the years in uncalibrated radiocarbon years. The horizontal axis (bottom) shows the years in calibrated calendar years from the year 1950. The red curve illustrates a simplified calibration curve. As an example, 10,000 radiocarbon years on the vertical axis is 11,400 calendar years on the horizontal axis. BP is defined as before present and is measured from the baseline year, 1950. You can see how this that this can get confusing, especially if some authors report uncalibrated radiocarbon years while others report calibrated calendar years. It is beyond me why the archaeological community has not standardized their reporting criteria for radiocarbon dates. The cynical side of me wonders if the scientists and authors want their readers confused. See you in Part Two of my series and I will show some examples of this confusion. Until then, read my book series, please! Figure Six - What do you mean you haven't ordered my books? CLICK HERE! Figure One - Five High Plains Clovis spear points / knife forms surface found on private land. of the point. Longest point is 3.85 inches long. John Branney Collection. Close your eyes and imagine the emptiness of North America thirteen thousand years ago. No cities, no towns, no highways, no planes. Not much of anything except a few bands of roaming Paleoindians spread across the expanse of a continent, living amongst a land of countless animals. After its discovery and coronation in the 1920s and 1930s in New Mexico, Clovis became the royalty of North American archaeology. Scientists proclaimed the mammoth hunters who made the Clovis artifacts the First Americans, i.e. 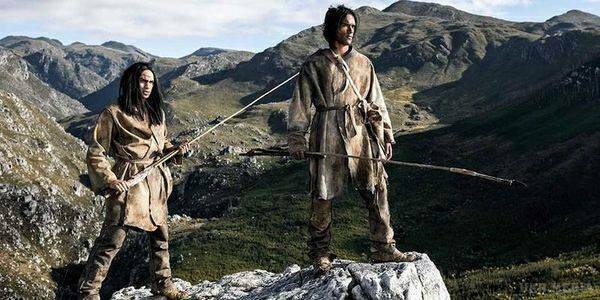 the first humans to ever walk on North American soil. Clovis technology has taken the breath away from artifact hunters and scientists alike. 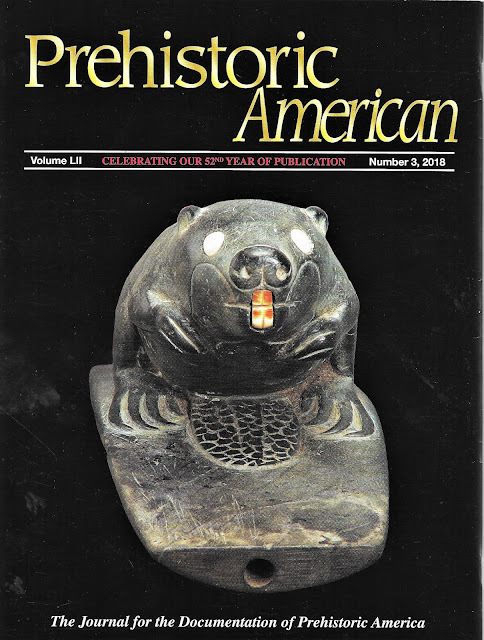 Books and magazine articles have fulfilled our insatiable appetite for Clovis artifacts and the Paleoindians who made them. No other prehistoric culture or technology in North America has drawn as much attention as Clovis. Clovis site in New Mexico in 1933. We know from current archaeological evidence that Clovis technology started showing up in North American sites around 13,500 years ago. Where did the Paleoindians who made this technology come from? The first and the longest held belief was that Paleoindians, originating in Asia, crossed the Bering Strait from Siberia into Alaska during the last ice age when ocean levels were low. Since these Paleoindians were considered the First Americans, they either had to bring Clovis technology with them from Siberia or they had to invent it here. The Clovis First theory held water for decades and there are still a few scientists who hold it dear, but we have yet to come up with the "smoking gun" that proves Paleoindians crossed the Bering Strait bringing Clovis technology with them. When it comes to Clovis technology, what is that smoking gun? Clovis technology is represented in the archaeological record by stone projectile points, prismatic blades, blade cores, and unifacial tools made from blades. Clovis technology was heavy into blade technology. Clovis technology also includes projectile points and foreshafts made from bone and ivory. Clovis technology is also associated with red ocher as these Paleoindians sprinkled the hematite-rich powder indiscriminately over artifacts and burials. Other Paleoindian cultures used the above technologies occasionally, so these were not unique to Clovis. However, there is one technological innovation that had a Clovis signature. The "smoking gun" that distinguishes Clovis from others is the "Clovis flute" on projectile points! Clovis projectile points are quite distinct, you might say they are one of a kind. 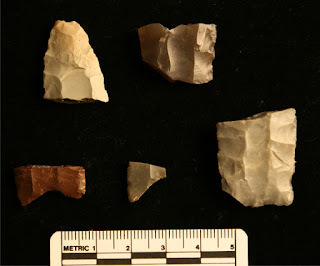 Beyond their distinctive outline and flaking pattern, Clovis projectile points had another special feature; they had a flute or groove, starting at the center of the base and running toward the tip of the projectile point (figures one and three). Artifact hunters and scientists have found fluted Clovis projectile points across the lower 48 states. Artifact hunters and scientists have discovered Clovis or Clovis-like projectile points from coast-to-coast, from Canada to northern Mexico. This was an amazing dispersion of technology over a little more than three hundred years. Adaptation of Clovis technology must have been quick and decisive. Clovis or Clovis-like projectile points are one of the most recognizable projectile point type in North America. If Clovis technology came to North America through Siberia, why can't we trace Clovis technology back to Siberia? extraordinary flute. John Branney Collection. 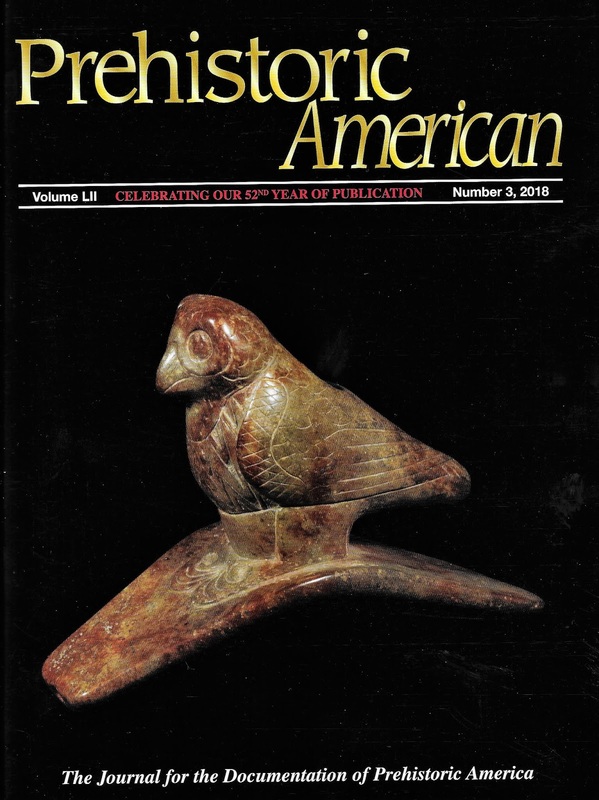 A master flintknapper named Bob Patten once wrote, "If, as it appears, the Clovis tradition [fluting] was invented here [North America], someone must have already been here to invent it." They say that hindsight is 20-20. To believe that there were no humans in North America prior to Clovis has always seemed naïve to me. Every other continent on the globe has evidence of humans going back tens or hundreds of thousands of years. How do we account for North America being human-free until around 13,500 years? How did North America stay isolated from the “Cradle of Man” in Africa for million or so years? 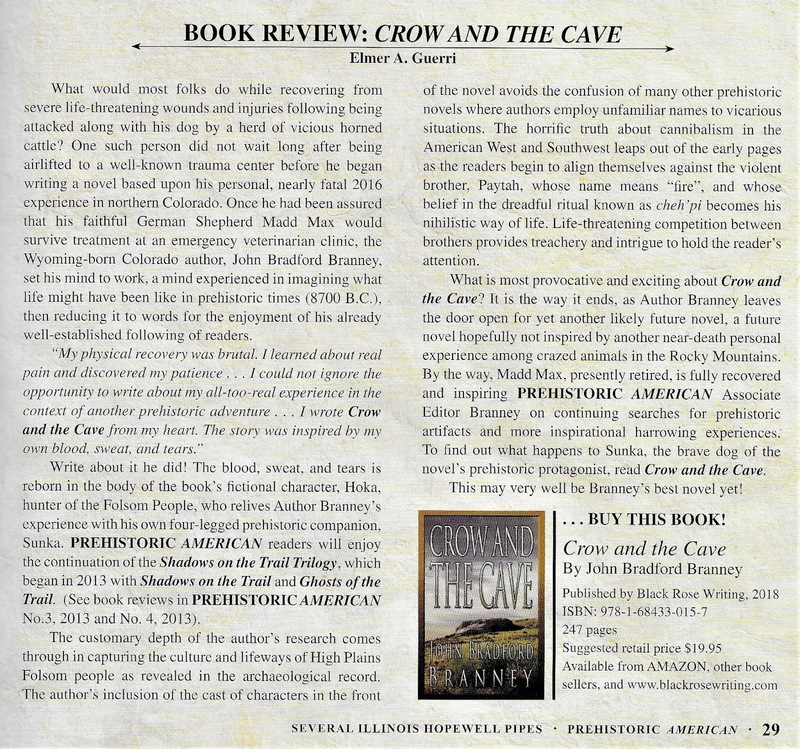 Ninety years after scientists first documented Clovis in New Mexico, there is undeniable archaeological evidence in North America that Clovis people were not the First Americans. Perhaps, scientists were so locked into their ‘Clovis First’ theory that they poo pooed anything that disputed it. Perhaps, when they dug archaeological sites, they stopped digging once they found Clovis. In the past two decades, the "Clovis First" theory has taken severe blows and is down for the eight count and dead to some of us. Archaeological discoveries older than Clovis are aplenty, pushing human entrance into North America to 14,500 years, 15,000 years, 16,000 years, and beyond. It would not surprise me that some day soon archaeological evidence will prove early man was in North America over 50,000 years ago. As far as the origin of Clovis technology, the mystery remains unsolved. In 2011, scientists excavated Clovis-like fluted projectile points at a site called Serpentine Hot Springs in northwest Alaska (Figure four). Was this the smoking gun everyone was looking for? Charcoal from the site dated around 12,000 years, a thousand years younger than Clovis technology in the lower 48 states. If the Clovis-like fluted projectile points in Alaska originated in Siberia as the Clovis First theory contends, then the Alaskan points should be older than Clovis technology in the lower 48 states. Instead, the Clovis-like fluted points at Serpentine are one thousand years younger, possibly indicating that the Clovis technology dispersion direction was from the lower 48 states to Alaska, and not visa versa. Bottom line? We still have no smoking gun for the origin of Clovis technology. younger than Clovis in the lower 48 states. Figure One - 3.5 inch long limace, surface found on private land in Yuma County, Colorado. John Branney Collection. "WHACK!” A massive paw exploded out of the blackness of the cave. A curved claw ripped the tip of Cansha’s nose wide open. Cansha’s eyes saw red as he felt the jolting pain. He grabbed his severed nose with both hands and fell backwards onto the pile of bones and half frozen feces. The sensation was horrendous. Tears flooded Cansha’s eyes. His hands filled with blood as he laid there in agony in the muck. His nose stung like the poisonous bite of a rattler. Blood escaped through his fingers. The man eater shoved its front leg through the gap, its claws outstretched, searching for flesh. The boulder wobbled back and forth as the huge beast pressed against it. Cansha rolled around on the ground as he fought to escape the pain. He could not see anything through blood and tears. He stood up and staggered on unsteady legs. He feared the beast would escape. A roar erupted from the cave. The boulder rocked further. The man eater’s leg squeezed out through the widening gap. Heesha kicked her father in the leg, waking him up. The thunderous call of the beast resonated across the plains. Heesha scrambled down the slope and reached her brother. She saw the blood all over Cansha. The claw had split Cansha’s nose right down the middle. Another roar from the man eater refocused Heesha’s attention. She watched in horror as the massive claw swiped at empty air. The boulder slid as the man eater pushed against it. The above scene is from my latest prehistoric adventure titled the CROW and the CAVE. 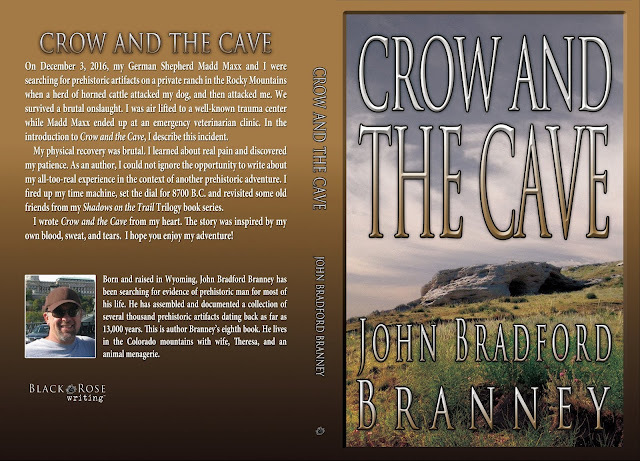 If you read my other prehistoric adventure books, you might be asking, "What kind of precarious situation did I put the Folsom People in this time?" You will just have to read CROW and the CAVE to find out. I promise you there are plenty of precarious situations from front cover to back cover. or in France, a limace. 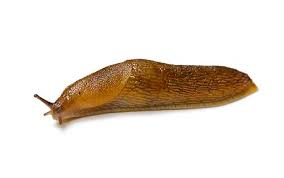 Now onto my main topic…A slug in France, as in an ordinary garden slug, is known as a limace. Most of us have spotted a slug or two in our gardens or crawling across our sidewalks (Figure two). They are pretty nasty-looking creatures. What does this unattractive creature have to do with my books or archaeology? French archaeologists took their word for slug, limace, and described prehistoric stone tools that resembled the shape of a slug. Voila! The name stuck. A limace is a type of prehistoric blade tool, retouched by its knapper along both edges, creating a slug-shaped artifact. A rather large limace from my personal collection is photographed in figures one and three. along the edges. John Branney Collection. Limaces are plano convex in cross section. Plano convex means that an artifact has a flat underbelly (ventral side) and a humped back (dorsal side). Another word to use for this is unifacial. Limaces are oblong or teardrop-shaped. Because of their defined purpose (I write about this later), limaces started out bi-pointed with sharp ends. Some limaces had steeply angled faces due to unifacial retouch, much the same as the "bit" or working end of a plano convex end scraper. Based on analyses, there is a high probability that prehistoric tool makers hafted the majority of limaces into a rigid socketed handle of bone or wood. Providing evidence for hafting, investigators pointed to the deliberate abrasions on the basal edges of some limaces and the ‘trim to fit’ dimensions on the proximal end of some other specimens. get much more slug-like than this one. Most investigators believe that prehistoric people utilized limaces as stone chisels for shaving and gouging hard materials such as wood, bone, and antler. Based on this harsh activity, it would not take long for the working end of a stone limace to look beat up and rounded. Limaces are a rare find and the destructive nature of their usage may be responsible for the rarity. It is tough to find a limace in excellent shape such as in figure one. I have probably surface recovered many broken and used up limaces, but not known what they were. I am sure prehistoric, conservation-minded people repurposed many broken and used up limaces into other tools, such as plano convex end scrapers. In the literature, I have noticed other names for limaces or limace-like artifacts such as hump-backed scrapers, humpies, flakeshavers, awls, perforators, unifacial drills, slug-like scrapers, groover, slugs, bar, boats, Hendrix scrapers, and bipointed bars. This does not mean that every single specimen in the above artifact types was a limace, but that actual limaces might be mis-categorized in collections. rather large limace or maybe a "hump-backed" whale ;). John Branney Collection. artifacts in both Siberia and Japan, dating to pre-Clovis times. Sampson also noted at least five other well-documented Paleoindian sites where investigators found limaces or humpies; the Shoop Site in eastern Pennsylvania, the Debert Site in Nova Scotia, the Bull Brook Site in Massachusetts, the Vail Site in Maine, and the Lehner Mammoth Kill Site in southern Arizona. Other sites reporting limace or humpie-like artifacts include Plenge, Lindenmeier, Whipple, Shawnee-Minisink, and Krmpotich. Based on current archaeological evidence, it appears that “true” limace tools were most likely associated with Paleoindians and large Folsom, Clovis, and fluted point assemblages. Now, why don't you support this starving author and buy / read the SHADOWS on the TRAIL QUADRILOGY? in Kings County, California by Connie Hudson prior to 1970. When I think about the process of using an atlatl weapon system, the above song comes to mind. Many of us have sang that song. The various muscles and bones in the human body must work together in unison and harmony, and to make a successful atlatl throw, various components in the atlatl weapon system must work together in unison and harmony. One big difference between the atlatl and human body is that in the atlatl process one of the components detaches from the rest of the components; the atlatl dart. We better hope that we don't have any detaching components in the human body! Figure Two - Atlatl mechanics. Most experts believe that prehistoric humans had access to the atlatl weapons system in North America as far back as Paleoindians. Archaeological evidence for this is circumstantial. However, we do have clear evidence that the atlatl was in play in North America as early as the Middle Archaic. Based on archaeological evidence, bow and arrow technology replaced atlatl technology in North America sometime around A.D. 200 to A.D. 500. However, there were some atlatl holdouts. When Spanish explorer Hernán Cortés landed in Mexico to conquer the Aztecs around 1519, he found the atlatl in use within the Aztec population. Cortés also found out that Spanish chain mail armor wasn't always effective against the penetration of an atlatl-thrown dart. connects the dart to the handle. An atlatl handle is a piece of wood, bone, or antler two feet long or so. The purpose of the atlatl weapon system is to extend the arm of the thrower much like a lever. When thrown properly this increases the velocity of the thrown dart (see links below for my other blog postings on the subject). One end of the atlatl handle was for the thrower's hand while the other end connected to the atlatl dart via a peg, hook, or spur. A cup at the end of the atlatl dart fit onto the spur of the atlatl handle. polished tip of the hummingbird spur. I will be referring to the peg, hook, or spur as simply the spur. As mentioned, the spur fits onto the atlatl handle and connects the atlatl dart to the atlatl handle. The spur and atlatl dart work on the same premise as a ball and socket. A ball and socket is a mechanical connection where the ball (in this case the spur) rotates in a socket (in this case the cupped end of an atlatl dart) allowing rotary motion within certain limits. In other words, the cupped end of the atlatl dart rotates on the point of the spur until it disengages from the atlatl handle during the throw. The dart stays engaged to the spur during the throw because the atlatl handle is traveling at a faster rate than the dart. When the user begins his throw, his arm pulls the atlatl handle forward and upward, and the cupped end of the dart rotates on the point of the spur until the dart disengages from the atlatl handle on its way to the target. atlatl spurs tended to be the least perishable part in the weapon system. Investigators and collectors have found evidence for the use of the atlatl in California in most every region of the state in the form of atlatl spurs. In fact, California has enough prehistoric atlatl spur examples to classify them within categories. (Ralston and Fitzgerald 2014). bird head spur was used. Figures one, four, and five show an example of a prehistoric atlatl spur found in Kings County, California by Connie Hudson prior to 1970. Robert Butler certified this as a museum grade atlatl spur (figure five). Most of the people I have spoken to who have knowledge about atlatl spurs believe this spur represented a bird's head. One person went as far as to claim that the bird's head was a hummingbird. A bird's head would be an ideal symbol for an atlatl. 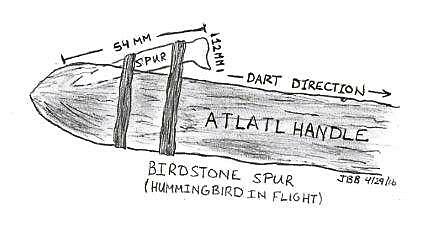 If we think about an atlatl dart flying effortlessly through the sky, what better symbol for a successful flight than a bird or hummingbird. The drawing in figure six represents how I believe the hummingbird atlatl spur was implemented. Check out my books at the end of this article! 2014 Candice Ralston and Fitzgerald, R. T. Two Atlatl Engaging Spurs from CA-CCO-18/548: A Critical Examination of Atlatl Spur Taxonomy. 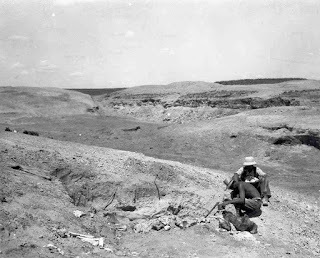 Journal of California and Great Basin Anthropology 34(1):101-108.
surface found in Wyoming. John Branney Collection. 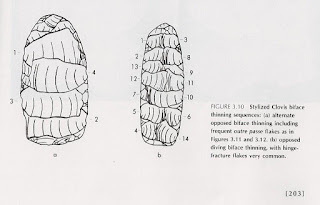 There is a good chance that the biface in Figure one is an ultrathin knife form from the Folsom prehistoric culture (10,900 to 10,200 years old). The late Jim Roth surface recovered this artifact on private land in Carbon County, Wyoming. For those of you who have read my prehistoric adventure series about the Folsom People, the popular SHADOWS ON THE TRAIL QUADRILOGY, my main character Chayton and other hunters in his tribe carried ultrathin knife forms to filet meat from the prey animals they butchered. Below is a short scene from the second book in my prehistoric adventure series, GHOSTS OF THE HEART. In this scene Chayton and the hunters had trapped and killed a small herd of now extinct bison. In this episode, the hard works begins - butchering. then cut the hide lengthwise down the back. They then pulled the hide to the ground on both sides of the carcass, creating a mat that would protect the butchered meat from the ground. The team of butchers extracted the tender cuts of meat under the skin of the back first, followed by the forelegs, shoulders, hump meat, rib cage, and body cavity. They would not waste anything. The team of butchers opened up each body cavity and removed the heart, liver, and gall bladder. With hammer stones, choppers, and stone knives, the butchers then harvested the hindquarters, hind legs, neck, and skull. As the team of butchers systematically stripped the meat from the carcasses, others carried the meat back to the camp where they cut it into strips and hung it from sagebrush and tree branches to dry. The Folsom People would make pemmican from the meat that was too tough to eat. They then extracted two more delicacies from the skull, the tongue and the brain. 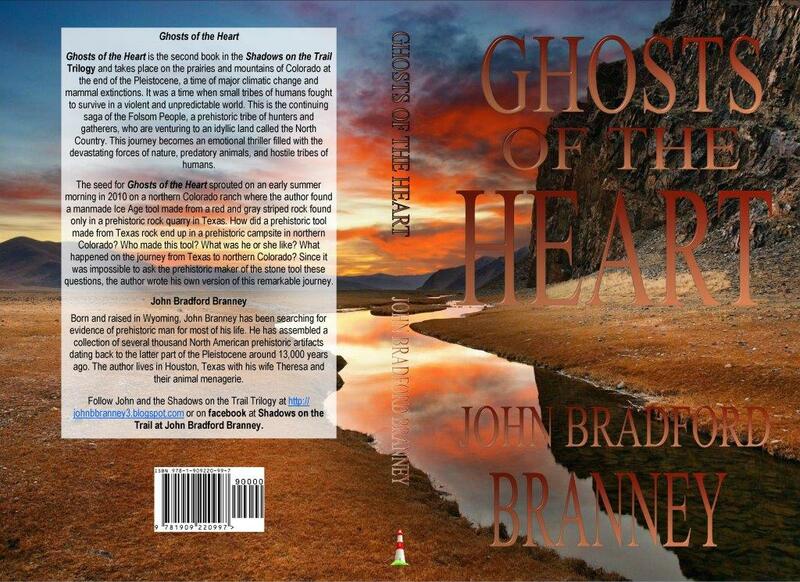 I hope you will join the adventure and read my book series, the SHADOWS ON THE TRAIL QUADRILOGY. You will be glad you did. Now, what do you think about this knife form? Is it Folsom or could it be Clovis? 1. The dimensions of this knife form are as follows; it is 88 mm long, 42 mm wide, and 5 mm thick. The width to thickness ratio is 8.4. The arbitrary width to thickness ratio for ultrathin knife forms is 7 or greater. 2. The raw material is wild. A beautiful semi-translucent, banded petrified wood was used by its maker. 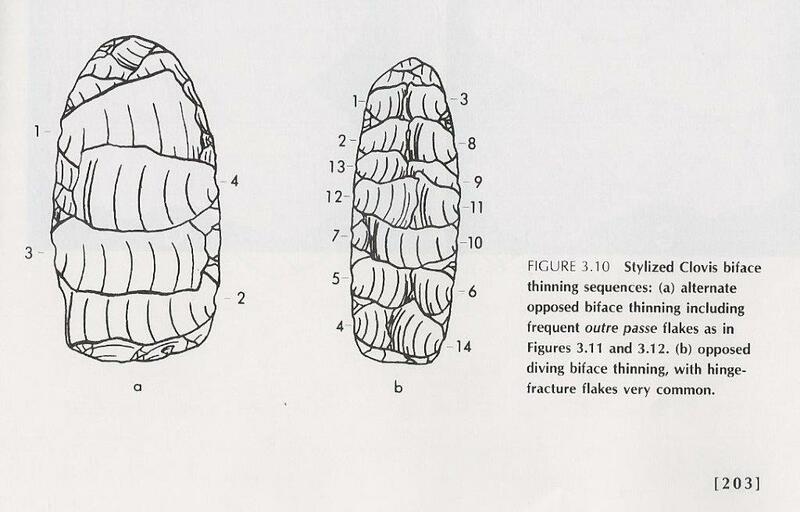 Figure Three - 3.5 inch long biface surface found in Wyoming. of biface. John Branney Collection. 3. In several flake terminations, there appears to be oxidized red ochre stains and deposits. Ochre is a natural mineral containing ferric oxide. It is typically associated with clay and varies in color from light yellow to brown to red. 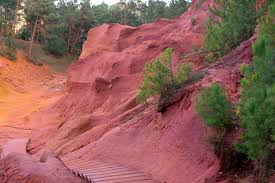 Red ochre has been found in many different archaeological contexts including occupations, especially Paleoindian occupation floors. Stone artifacts were painted with the red ochre and sometimes weapons and tools were covered in the pigment. It has also been associated with burials. Red ochre was widely used at Paleoindian levels at the Powars II, Hanson, Hell Gap, Sheaman, and Medicine Lodge Creek sites in Wyoming. Investigators discovered a grinding slab used for pulverizing red ochre nodules and rocks in the Folsom level at the Agate Basin site in eastern Wyoming. Note: I have NOT had this knife form chemically tested for the presence of iron or ochre. My assumption as to the presence of ochre is based on experience and observation of the deposits under high magnification. Figure Four - Red ochre in its natural state. explain the occurrence of red ochre in the hafting area of many Clovis projectile points. Some investigators also believe that Paleoindian flintknappers in North America might have used red ochre as an abrasive to polish and dull the lateral edges in the hafting areas of projectile points. Dulling the edges was a common practice in Paleo and Early Archaic times. Red ochre is also commonly found with Clovis tool caches but it is not known whether the occurrences were functional or ritual. 5. It is not coincidently that the predominant colors used in rock art and cave art in the Old World and in some cases, New World, were black (from charcoal, soot, or manganese oxide), yellow ochre (limonite), red ochre (hematite or burned limonite) and white (kaolin clay, burnt shells, powdered gypsum, or powdered calcium carbonate). Figure Five - Clovis biface thinning sequence. 6. I love Paleoindian flintknapping, especially their biface thinning through percussion technology. The flaking on the artifact in figures three and six screams Paleoindian. Paleoindians liked to attack a piece of flint with carefree but skilled abandon. The Paleoindian flintknapper's attitude was "why thin a biface with ten swings of the hammer when five swings will accomplish the same result?" Paleoindians thinned bifaces with wide, thin flakes that crossed the face of the biface, sometimes overshooting the other edge (see figure five). The end result was wide, thin, and long flakes that were exceptionally flat which thinned the biface without losing overall length or width. 5. On the artifact in figures three and six, several of these wide-thin-flat flakes terminate midway across the face of the biface, creating step or hinge terminations in the middle of the artifact. These diving flakes created a biconcave cross section for this knife form. Some of these diving flakes were met by diving flakes from the other side, creating an even more concave profile in the middle of the artifact. middle of biface. John Branney Collection. Few knife form or biface types are culturally diagnostic. It usually takes finding them in situ under a controlled archaeological process to determine age and cultural affiliation. This knife form was a surface find and I assume it was Folsom or Clovis, based on its production technology, knapping characteristics, and the presence of oxidized red ochre. But, just because that is what I think does not make it necessarily so. This is my opinion on this truly unique knife form. or a Folsom Ultrathin Knife or maybe something else?